Where Is One Direction ? Find Out Where They Are Now! 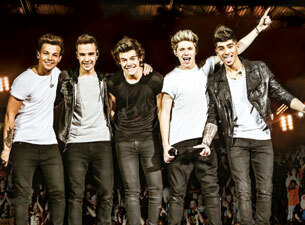 Over the last two years, there has been no hotter ticket than One Direction tickets. The boy-band, which was formed on X-Factor, has been touring non-stop over the last two years, leaving a wake of screaming teens behind. The ‘Take Me Home’ Tour ended in November and the ‘Where We Are’ tour begins in April, which means that between February 2013 and October 2014 the band will have played 196 shows. If you throw in the ‘Up All Night’ Tour from 2012, the total goes up to 258 in a three-year period. That makes the band one of the most active touring acts in the last five years. The two previous tours, however, were just warm-up acts for Where We Are. With 65 shows currently planned, the stadium tour will likely gross more than $300,000,000 in ticket sales. Based on the below calculation, that would put it into the top ten grossing tours of all time. The 2014 Coachella lineup is out — and in headline-grabbing news, OutKast will reunite to play the Friday shows across two weekends: April 11-13 and April 18-20. The Atlanta hip-hop duo of Andre 3000 and Big Boi has been on hiatus, releasing their most recent album in 2006. More than 150 acts will perform throughout the two weekends. Muse will headline the Saturday shows, and Arcade Fire will close out Sunday nights. Grammy-nominated singer Lorde will make her first appearance at the festival in Indio, Calif. Other performer highlights include The Replacements, Beck, Calvin Harris, Broken Bells, Haim, Neko Case, MGMT, Girl Talk, Foster the People, Ellie Goulding, Neutral Milk Hotel, Lana Del Rey, Pharrell Williams, Chromeo and Queens of the Stone Age.